One Foot of Link V Belt: 3L Section. 3/8” Top Width. Premium Urethane Molded Link V-Belts Sold by the Lineal Foot. Home > LINK V BELTING > 3L SECTION Link V Belt: Sold as Spool of 100 Feet 3L Section Link V Belting. 0.375" Top Width (10mm). > Link V Belt: 3L Section. 0.375" (3/8”) Top Width. Urethane Molded Link V-Belts Sold by the Lineal Foot (USA). Link V Belt: 3L Section. 0.375" (3/8”) Top Width. Urethane Molded Link V-Belts Sold by the Lineal Foot (USA). 3L SECTION (3/8” Top Width - 10mm Top Width) "LINK V BELT" REPLACEMENT - Premuim Link V Belt: 3L Section. Urethane Molded Link V-Belts Sold by the Lineal Foot. *Discounted at 10 or More Feet. 3L SECTION Link V Belt: Sold as Spool of 100 Feet 3L Section Link V Belting. 0.375" Top Width (10mm). 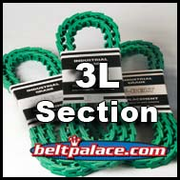 3L Section Link V Belt: Sold as Spool of 100 Feet 3L Section Link V Belting. 3/8" Top Width.